Mr. Vijay Wanchoo- SR. EXECUTIVE VP. & GM at The Imperial has been heading the hotel operations since June 2009. 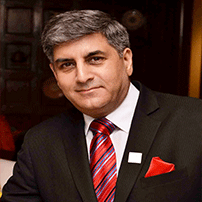 In his earlier tenure, as the Executive Assistant Manager from1996-99, he launched The Spice Route, Patiala Peg & Daniell’s Tavern restaurants and has experience spanning over 4 decades with other luxury hotel chains like The Oberoi Hotels and ITC Hotels. His various programs for guests & associates in his current innings, have taken the hotel to new heights, creating transformations at each stage. His thoughtful implementation of ideas has brought in strategic change while creating a memorable experience for the guests. He strongly believes in experiential luxury and says ‘It is all about creating a home away from home.’ From introducing Namaskar, The Imperial Culinary Club to celebrations of all major festivals with guests, his personalized initiatives have created unforgettable memories for many to come back. All his ideas have been extremely popular amidst global travelers at The Imperial and have elevated The Imperial experience.